Much of what you find written online about the Kolbrin is pure sensationalized fabrication. Marshall Masters stole the manuscript for the Kolbrin from the Culdian Trust (its rightful owners), renamed it “The Kolbrin Bible” (it makes no claims of its own to be a Bible), republished it under his own name and then marketed it to catastrophism planet X fanatics as a End Times book (of which it says little). The Kolbrin, much like the Book of Mormon, claims to come from a large collection of manuscripts and tablets engraven on metallic plates by ancient spiritual leaders/historians on the Islands of Great Britain. The book is predominantly composed of spiritual material but also contains a small amount of history. The earliest manuscripts in the book appear to have been written in Egypt some time just before the time of Moses by a religious cult referred to as “the sons of light”. Members of this organization immigrated from Egypt to Britain some during the first millennium BC and remained a cohesive unit until they were converted to Christianity just after the death of Christ. These records were then handed down through some type of hermetic order until persecution devastated the order and destroyed many of the manuscripts during the Romanization and later Christianization of Britain between 200-1100 AD. The book, much like the Book of Mormon is already the source of deep controversy. Skeptics, such as the authors of RationalWiki, claim the book to be a clever forgery. These authors show no evidence of ever having read the book or really taking it seriously. Much like the Book of Mormon, early skeptics called the book a hoax. But as more and more evidence of ancient origins come to light, those skeptics have changed their tune— now suggesting the historically accurate aspects of the text must have been forged from other ancient texts. Although the last major spiritual writings in the Kolbrin date to around the second century AD, the modern publishing of the Kolbrin are said to be traced back to a large collection of manuscripts salvaged from Glastonbury Abbey during an arson attack that was intended to destroy them. It was the time of history when there was a great suppression of monasterys. As fate would have it, the once considered heretical works were transcribed on bronze tablets by the religious druids of the time. Since they were thought to be destroyed during the fire, they were preserved in secrecy. Since then, much of the original text was lost or destroyed due to the passage of time, their environment, and human error. Each caretaker though, has gone to painstaking efforts to preserve what was left and to fill in the gaps with the correct knowledge in order to preserve the original meaning. 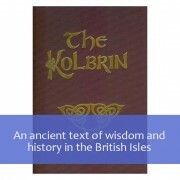 During the early fourteenth century, John Culdy, the leader of a small community in Scotland, owned The Kolbrin and took steps to ensure its survival beyond his care. The Kolbrin eventually became known as The Bronzebook of Britain, and the contents of additional salvaged manuscripts known as The Coelbook were later incorporated into it to form the modern version. In the early parts of the twentieth century, the responsibility of The Kolbrin’s preservation rested with a small religious group in England that never gained much power due their very restrictive membership requirements. The current custodian is The Culdian Trust, which was formed in 1980. The Culdian Trust inherited The Kolbrin and other books when the Hope Trust was deregistered around 1995 in accordance with its constitution. Around 1992, an elderly man from the Hope Trust who is now deceased put together the current draft from the originals. His character, reputation and relatives are still living. He was an extremely private man while alive and the trust are respecting his wishes with regard to continued privacy. The Culdian Trust members did not get to see the original manuscripts on which the most recent version of The Kolbrin was derived, nor do they understand how they came into the elderly man’s possession or where he sent the originals upon completion. They believe, based on speculation, that he may have been a member of a hermetic order probably based in England, so the original manuscripts may have gone back there. Despite the continued ambiguity of The Kolbrin’s origins, a Culdian Trust representative that knew the man for approximately twenty years held him in high regard and found him to be a man of extremely high integrity. It would almost seem that both the Kolbrin and Book of Mormon were preserved using the same interesting protocol. Each containing a record, a knife/sword, a shield of some sort and some type of seer stones or crystals to aid mystics in “translating”. In LDS and Jewish tradition there were multiple “seer stones” like the Urim and Thumim given by God (or might we presume, higher beings of some sort?) to man in the early days of civilization. As the Book of Mormon says concerning the seer stones they found of the Jaredites… “I will prepare unto my servant Gazelem, a stone, which shall shine forth in darkness unto light, that I may discover unto my people who serve me, that I may discover unto them the works of their brethren, yea, their secret works, their works of darkness, and their wickedness and abominations. And now, my son, these interpreters were prepared that the word of God might be fulfilled…” (Alma 37:23–24). It has been said by some sources that these stones were made of crystal and were fashioned to use the natural properties of these crystals to enhance the “psychic” or revelatory abilities of one with spiritual gifts (the ability to communicate with the dead or across dimensional boundaries? See Law of One, Crystals). This is likely where the idea of gypsies with “crystal balls” came from and why in this account the author accounts that his grandmother used these to “tell fortunes”. In the Book of Mormon, Ammon warns of this type of misuse of seer stones saying, “no man can look in them except he be commanded, lest he should look for that he ought not and he should perish” (Alma 37:23). Much like the Old Testament, The supposed Jaredite Plates, and Oahspe, The Kolbrin starts with a creation story. Although it shares similar aspects with the Bible account it gives several versions and uses very different wording. The sophistication of the language has more of an eastern flavor than most ancient western creation accounts. -It also contains an account of a Global Flood of sorts and of the Israeli exodus in very, very different format and style than those given in the bible (these accounts are from an Egyptian perspective). -The account of the destruction and recreation by flood and fire shares similarities to both the biblical noah’s flood and the Mayan account of the same events. (interestingly enough, one of these chapters is entitled “Maya and Lila”). -Much is spoken of Osiris and other early Egyptian myths. Many late period gnostics adapted these myths into Israel’s Abraham. Comparison of these ancient texts with early Jewish, later gnostic, or the channelings of Joseph Smith on Abraham may give insight into possible truths which often lie behind ancient mythos and the modern cultural adaptations. -One can find evidence suggesting that the Kolbrin’s story of Hurmanetar is actually an ancient Egyptian version of the Akkadian epic Gilgamesh in this article. Hurmanetar as Gilgamesh. -One can find evidence suggesting that the Kolbrin’s account of the pharaoh Nabihaton is actually the historical Akhenaten in this article. -Pharaoh Nafohia could be Nefaarud, known to have ruled after Egypt’s revolt of Persia’s king Darius. -‘Pharaoh Athmos’ mention in Sons of Fire 6:9, is likely Pharaoh Ahmose of the 18the dynasty who ruled around 1550 BC. The Kolbrin also mentions that sometime after “Egypt was at war with the Abramites for their great red-headed king had committed adultery with the wife of a prince of Paran”. This could possibly be a reference to some Judge or faction of the early Israelite nation. -The accounts of “Hiram” could possibly be referring to Hiram of Tyre, or some other Mediterranean King with this popular ancient name. -Many other correlations can be drawn between Egyptian pharaohs mentioned in the Kolbrin and Historically verified accounts of Egyptian history. -The death of “Okther 165 years ago” could refer to Octha, founder of Saxon Kent. This would give 677 AD minus 165 = 512; Octha’s death date is unknown, usually put at 522 or later. But he is not mentioned in the Anglo-Saxon Chronicle and in British sources like Nennius seems to be earlier, taking over from his father (or grandfather) the legendary Saxon leader Hengist after 488 AD. -However, we also have a date of 677 AD as year 2 of Ketwin’s kingship of West Saxondom and year 14 of Ardwulf’s reign over the East Saxons. The Anglo-Saxon Chronicle has a ‘Centwine’ ruling Wessex 677-, yielding 678. Ardwulf is not the name of any recorded Anglo-Saxon king, but there was an Aldwulf ruling East Anglia from 663/4-, which would give us a writing date of 677/678 AD. “The “fourth year in the reign of Lothir, king of all the Kents” leads us to Kentish king Hlothhere (Latin Clotharius or Lotharius) who acceded 674/675, yielding a date of 678-9. -There are various similar mentions in both Manuscripts 6 and in the Admonitions/Lament of Ipuwer. In the last 15 years since its publishing, the Kolbrin has gained an often cult-like following of supporters and defenders. Much like the Book of Mormon, these followers use their own cultural knowledge to attempt to find parallels between things found in the book and modern historical knowledge. See the Culdian Message Boards for examples. 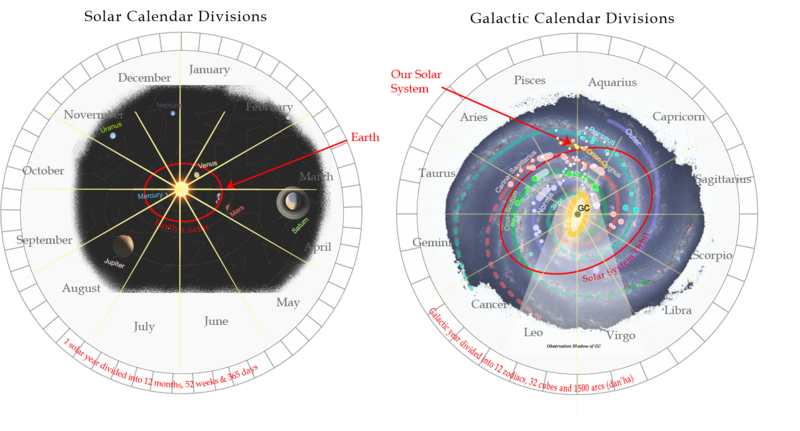 The following chart summarizes the correlations between the scientific geologic timeline and the scriptural timeline. As mentioned in the main geologic correlation article (link), …. 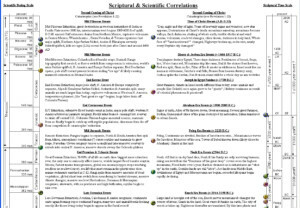 Chart shows the correlation between scientifically discovered and dated events, and scriptural events. 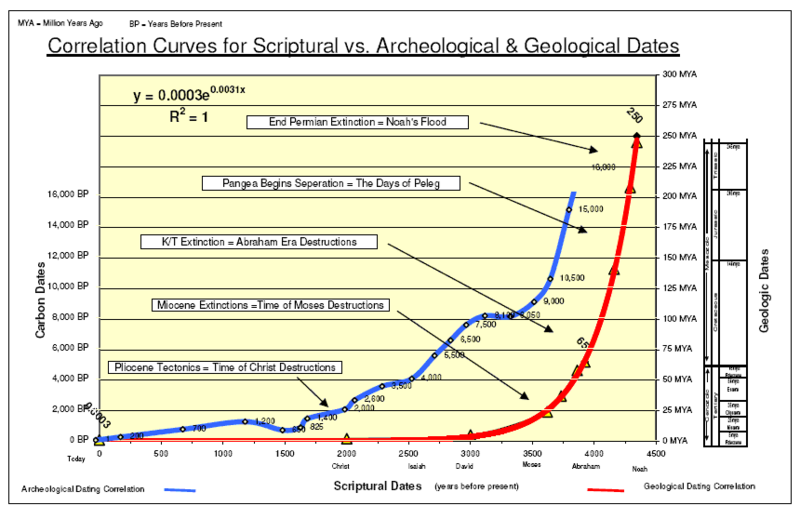 Superimposed correlaton curves for geologic and archeologic dates vs. scriptural dates. Link to excel spreadsheet versions of these…. There are three divine beings. The true Gods (the I AM’s), the false gods/idols (the demiurge/anti-Christs), and the dark lords (Satans). The Satans live in the realm of darkness (hells), the true gods and false gods both live in the realm of light, but the false gods become the Devils of the next cycle. The true Gods are what they are. They do not crave or like worship. They are simply the beings of the higher levels who do their best to serve and help those of the lower levels progress (because that the type of people they are). The false gods (demiurge/anti-christs) are created by the people in the same way that Israel disobediently created Saul and David to be their kings. The blind masses want a celebrity to worship. They want a king to rule them. They want a golden calf to dance around and they create these in their own minds… then an egocentric individual steps into the mold created by the masses. If he does not live up to the mold, he is overthrown from office and a new sycophant is inaugurated. They pretend to rule the masses, but in reality, the masses rule them. They are puppets.. the puppet rulers of the true Gods. The true Gods oversee and have power over all mortal and immortal existence. But they wish for people to rule themselves and always do their aiding and managing in a laissez-faire manner. But when the people want a king or god… they give the people what the want. They let them select some poor puppet and allow the people to carve them into what the masses crave, all the while knowing that the fate of all idols is the axe and the fire. The Church of the Devil (Satans) is the whore of all the earth. But the anti-christ/demiurge is a whore too. It is one who offers sexual union with only the flesh. One who masquerades at-one-ment with only one aspect of their being. The flesh is not the soul. It is only one aspect of the soul… a covering that hides spirit. Both man and God have many layers and to “know” God or another individual is to know and love all their layers. Because of the law of one, it is often true that a person with a beautiful body has an opposite and equal ugliness to some aspect of their spirit being. True union in the marriage chamber entails accepting and embracing the whole individual both beautiful and ugly. A whore offers only the flesh in a union that is far from oneness. It is a selfish union where energy transfer is not equal. It drains and distorts. So it is with the demiurge. He offers one aspect of the ONE TRUE GOD and says I am GOD, know me and gain eternal life. And yet he does not reveal his whole self nor does he give it. He selfishly takes and leaves his “subjects” drained and violated. His does not offer true at-one-ment for he has not yet truly at-oned himself. He does not reveal both his “good” and his “bad” nor does he lift his brethren up with him. He does not tell man that he was once like them and that they are one step behind being his equal. He does not unclothe his first and his last, his beauty and his uncomelyness nor his wrath with his patience. It’s no mistake that the same Hebrew & Greek words that Christ uses in John 17 saying that life eternal is to “Know” God, is also used to describe procreation in the Bible. Knowing God is like “knowing” a man or a woman. It is a very sacred and deep parallel. Man is hidden beneath clothing because his glory is too much for the innocent. But both Man and God were initially clothed with the intention of being revealed. Those who are afraid of reading another’s religious texts or scripture are like those who are afraid of seeing another uncovered. To unclothe God is to play with fire and one must take care not to get burned. But if we seek truth to be our bride then we must get past the covering which has been placed on her to truly know her. We will not change the truth by uncovering it. The fear of “false doctrine” is like the fear of falsely judging a bride to be. A fool-hearty youth may be allured to marry fine clothing only to find that it covers hideous tattoos and blemishes. She may marry a handsome body only to find it covers a hideous soul. But in the end, one must learn that clothing, body and soul are all aspects of that individual, and to love the individual one must know and accept all of its aspects. So it is with God and his truth. A fool-hearty youth may be led to many false judgments about God by judging the appearance of one of his coverings. But in the end, to “know” God is to know and see ALL of his coverings and to learn all aspects of his being. It is to see the meaning and beauty of how the “good” and the “bad” (by our skewed judgments) work together to form his I AM. He IS. BEING HE IS BEING. And to know him one must play with fire… for the ALL CONSUMING FIRE is his name. There are ample types of the three divine ones in the scriptures. The first born, the last born and the middle. Whether it be Cain/Abel/Seth or Japeth/Shem/Ham or Esau/Isaac/More or Reuben/Judah/Joseph or Laman/Lemual/Nephi/Sam/Jacob, in nearly every instance the firstborn who believes he has earned the right to the birth-right is rejected and the middle-born receives it. The first becomes last and the last becomes first. Scripture suggest that this type plays true for even Lucifer and Christ. The Son of the Morning being the “first born” believed it was his right to rule this world, so when the Father rejected him and his rule declaring Christ to be the firstborn before him, he revolted and took a third of the host of heaven with him. The secret is that those that make themselves first always are rejected causing a fall to become last. While those who make themselves last are made first by the law of justice… and if they then sacrifice that first estate on the cross, they fall to the middle and become exalted in the center of it. They become the first AND THE last, the alpha AND omega. The true Gods who have at-one-ed the opposites. So can you solve the mystery? Who is the demiurge? Who is the anti-Christ or the demiurge that will reveal themselves in the last days? The one who is to become the “Master Mahan” of the next cycle? These are the deep mysteries intended for the inner circle. For the rest of us, we shouldn’t dwell too much on them. Just live a good life and press forward in faith.